The second step in the research process is about discovering your target user’s needs and translating these into customer insights. Needfinding is the investigative process by which you uncover your customer’s needs. Empathy is the core value in the process of needs discovery. Only through empathy can you take on your customer’s perspective and understand both their expressed and latent needs. Ask about specific occurrences or instances, rather than usual uses. Encourage stories. they help reveal how user thinks about the world. Listen to nonverbal cues. Body language, emotions. Keep questions short and concise. 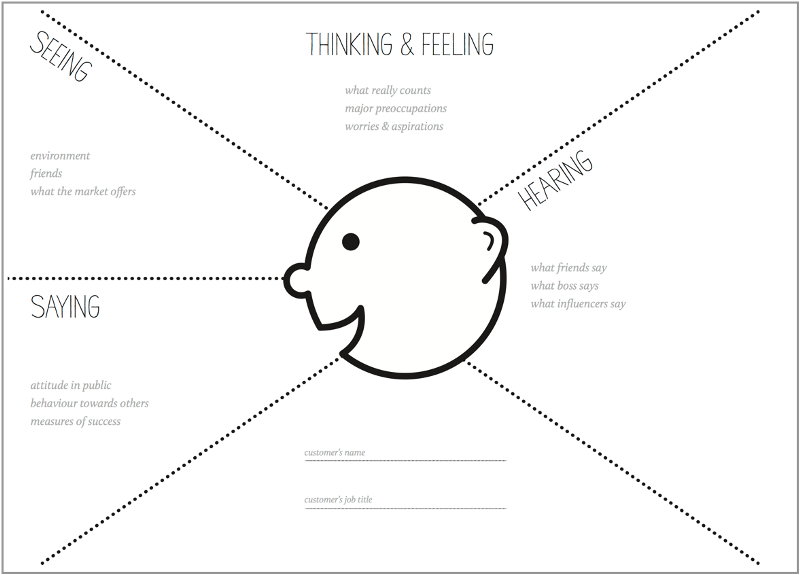 Empathy maps are great tools for synthesizing your observations into different buckets, based on what your customer: Says, Feels, Thinks, and Does. Collaboratively, you and your team can develop a deep understanding of your customer’s behaviours and needs and turn these into customer insights. What is the user thinking & feeling? What are their worries and aspirations? What would the user see while using our product in their environment? What might the user say do while using our product? What are some of the user’s pain points or fears when using our product? What gains might the user experience when using our product? I hope the frameworks I’ve shared guide you along the task of researching and developing insights about your customer’s needs. In the next post, I’ll cover how to translate your customer’s needs into a series of desired outcomes and jobs-to-be-done.